At 11AM Thursday, Irma remains a dangerous category 5 hurricane with winds of 175 mph. It’s moving WNW at 16 mph and is located about 120 miles SE of Grand Turk Island in the Turks & Caicos. Irma is expected to continue this general WNW motion over the next couple of days before making a northward turn as it nears the state of Florida. Hurricane watches are now up for all of South Florida. The time of that right hand turn is critical in determining the range of impacts felt across the state. The worst of the weather will be felt on Irma’s northern and eastern sides. 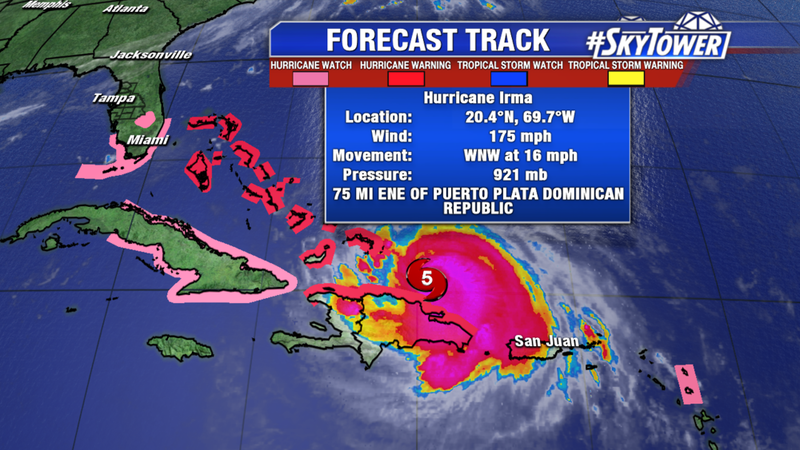 Areas directly in front of and east of the center of the storm can expect sustained hurricane force winds for a time. While winds on the western side of the eye will be decreasing the further west you go. It’s still too early to pinpoint the impacts for an exact location, as a shift in track of just 20-30 miles could dramatically change who sees what. As of now, the entire Florida peninsula is in the cone of uncertainty and should be preparing accordingly. Mandatory evacuations are now in effect for the Florida Keys, as well as coastal portions of Miami-Dade, Broward, Brevard, and Martin counties. Heed warnings of local authorities. The deepest water will occur along the immediate coast in areas of onshore winds, where the surge will be accompanied by large and destructive waves. Surge related flooding depends on the relative timing of the surge and the tidal cycle, and can vary greatly over short distances. WIND: Hurricane conditions are expected to begin within the hurricane warning area in the Dominican Republic and Haiti today. Hurricane conditions are expected to begin in the southeastern Bahamas and the Turks and Caicos Islands later today with tropical storm conditions expected within the next several hours. These conditions will spread into the central Bahamas by tonight or early Friday. Hurricane and tropical storm conditions are possible within the watch area in Cuba by Friday. Tropical storm conditions are expected to begin within the warning area in Cuba tonight. Hurricane conditions are expected in the northwestern Bahamas Friday night and Saturday. SURF: Swells generated by Irma are affecting the northern Leeward Islands, Puerto Rico, the Virgin Islands, the southeastern Bahamas, the Turks and Caicos Islands, the northern coast of the Dominican Republic, and should start affecting portions of the southeast coast of the United States later today and tonight. These swells are likely to cause life-threatening surf and rip current conditions. * Cuba provinces of Guantanamo, Holguin, Las Tunas, Camaguey, Ciego de Avila, Sancti Spiritus and Villa Clara. This entry was posted in Daily updates by Tyler Eliasen. Bookmark the permalink.